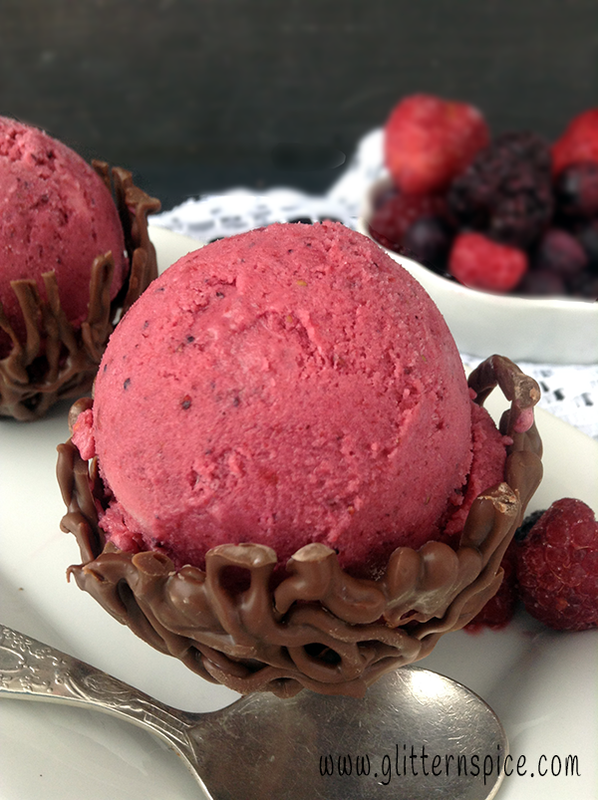 Make Valentine’s day special for your loved ones by serving them scrumptious and decadent Bumbleberry Frozen Greek Yogurt served in mini chocolate bowls. It is the perfect heart-friendly dessert for ending a delicious meal on a sweet and healthy note. Berries are packed with anti-oxidants that lower blood pressure and raise good cholesterol, which is great for the heart and chocolate is just plain good for the soul. In the small town I live in, we have a kitchen gift store that sells the best frozen yogurt and ice cream ever! Once in awhile, I like to splurge and treat myself to a triple berry frozen yogurt cone, but since I like to save money, I thought I would try and make it at home instead. I must say, I am very pleased with the results and it tastes just as good, if not a wee bit better! 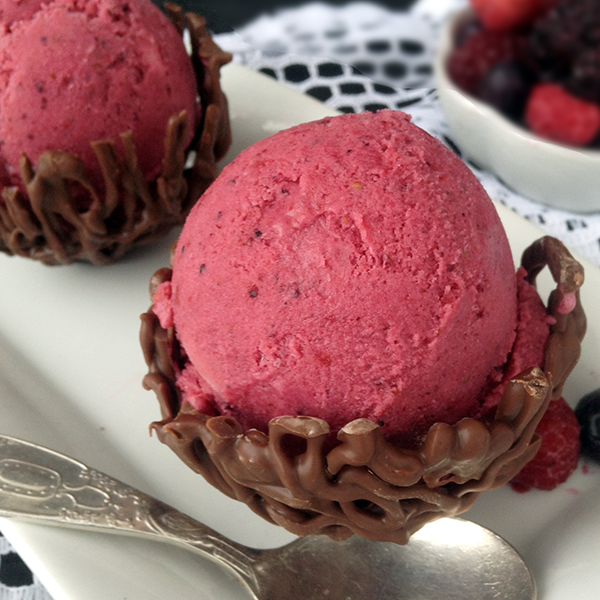 I used only three ingredients to make my version of bumbleberry frozen greek yogurt – frozen mixed berries, plain greek yogurt and agave nectar. I tossed all the ingredients into my food processor and in just 5 minutes, I had soft and creamy frozen yogurt that was ready to eat. I like my frozen yogurt a little bit firmer, so I put it in the freezer while I made some fancy, edible chocolate bowls to serve it in. 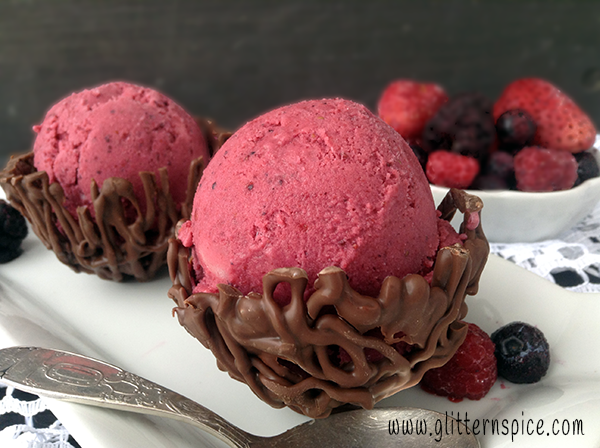 Being Valentines and all, I thought it would be a fun treat for the kids if I served the mixed berry frozen greek yogurt in mini chocolate bowls. I found a great tutorial online on how to make chocolate bowls using three different methods and I was inspired to try my hand at making some mini chocolate bowls using the frozen ice spheres method. I received a pair of Zoku Ice Molds to try free of charge which are the perfect size and shape for making mini chocolate bowls. 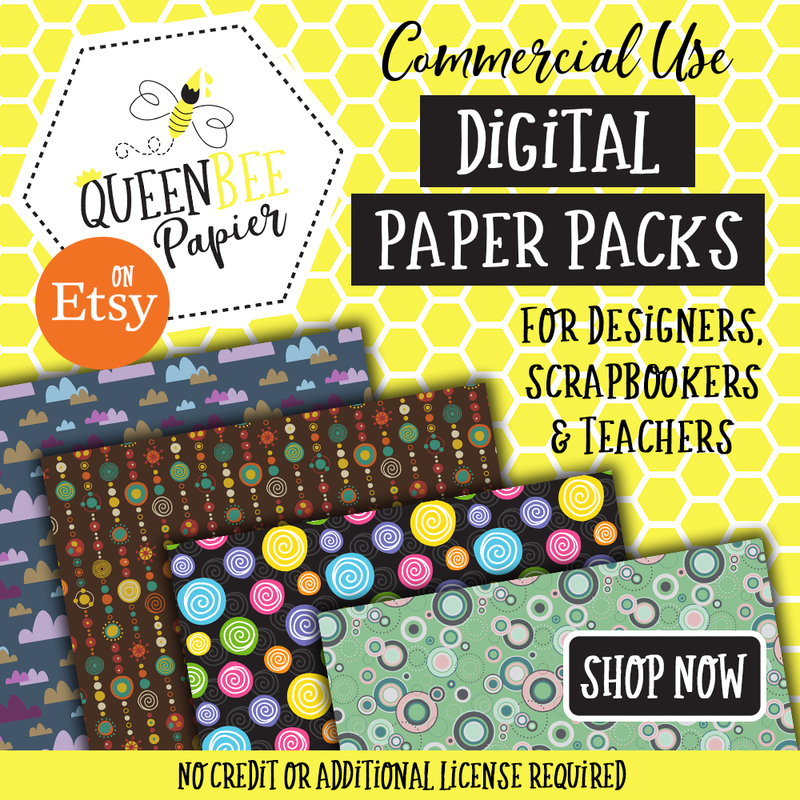 I am not being compensated for this post, but it does contain affiliate links which means that if you click on one of the product links, I’ll receive a small commission at no extra cost to you if you decide to make a purchase. The opinions expressed on this page are purely my own. Zoku has a fun line of instant frozen dessert products for making frozen drinks, ice cream and popsicles in mere minutes. Follow Zoku on social media for more delicious recipe ideas and to stay up-to-date on the latest products. I used only the bottom halves of the Zoku Ice Molds because you need frozen ice sphere halves with flat bottoms to form the chocolate bowls on. Fill the bottom halves of the molds with water and freeze. Make as many ice sphere halves as the amount of bowls you plan on making. This step needs to be done a day or so ahead. Remove the ice spheres from the soft, silicone molds. 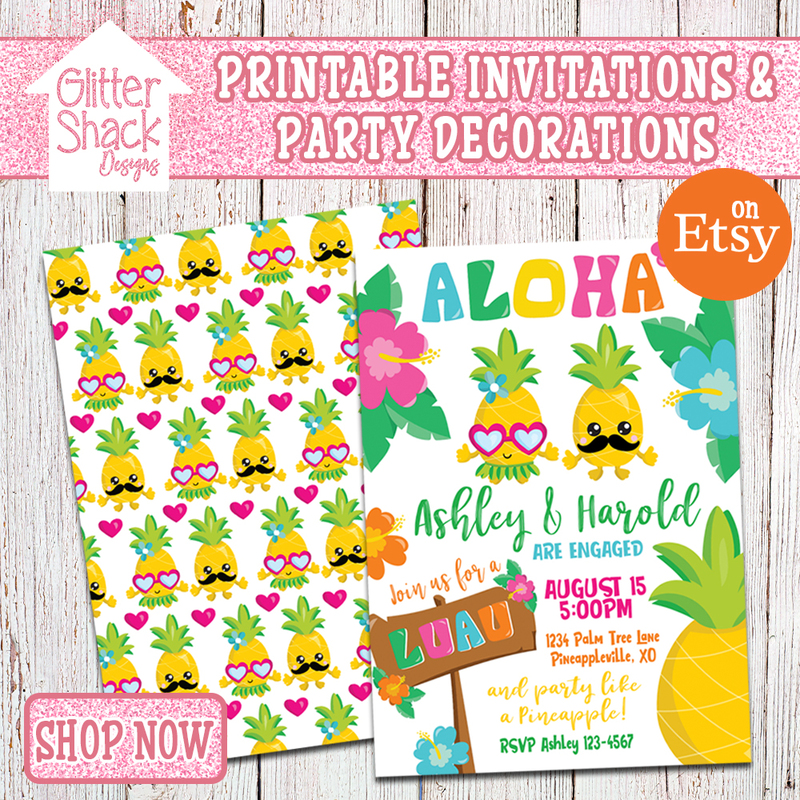 They will pop out easily – no need to run them under water. Place the ice spheres on a piece of waxed paper. Fill a decorating bag with milk chocolate candy melts and place in a pot of simmering water, removed from the heat. The chocolate will melt within a minute or two. Wipe the outside of the bag dry and snip a small piece from the bottom of the bag. 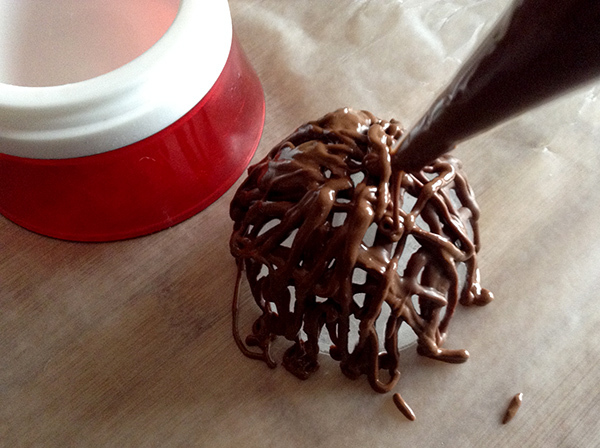 Pipe the chocolate from side to side on the ice ball in a criss-cross pattern. I used approximately 1/4 cup of chocolate melts for each bowl. Allow the chocolate to harden and the ice to melt for a couple of minutes. 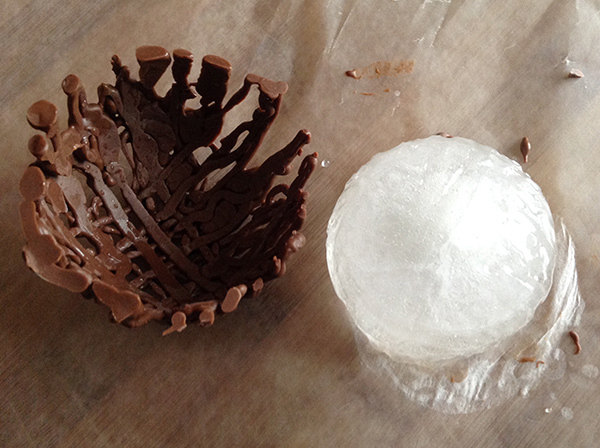 The ice sphere will have shrunk a little bit, allowing you to lift the chocolate bowl off the ice. Store the chocolate bowls until you are ready to use them in an air-tight container in a cool room or the fridge. 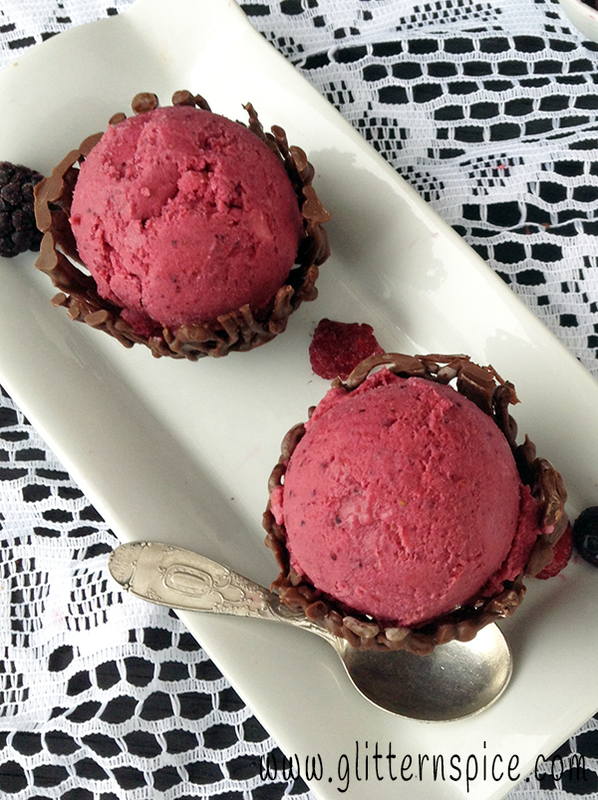 Here’s the recipe for my quick and easy bumbleberry frozen greek yogurt so you can try it and taste for yourself how delicious it is. It is packed with so much flavor, it is hard to believe something that tastes this yummy can be good for you! To keep it healthy, use dark chocolate instead of milk chocolate for the chocolate bowls. Place all the ingredients in a food processor and blend until the mixture is smooth and creamy/ Serve immediately or store in the freezer. 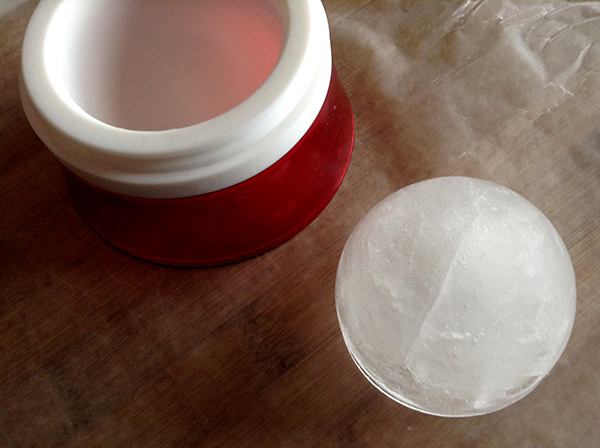 Make 6 frozen ice sphere halves using the Zoku Ice Ball Mold ahead of time. Place the frozen sphere halves on a piece of waxed paper. Place chocolate melts in a disposable decorating bag. Twist the top and secure with an elastic. Place the bottom of the bag into a pot of simmering water that has been removed from the heat. Allow the chocolate to melt for a couple of minutes. Remove the bag from the water and dry very well. Snip the end of the bag off. Pipe the chocolate across the ice sphere halves back and forth. Allow the ice to melt a little bit and the chocolate to harden for a couple of minutes. Lift the chocolate bowls from the ice spheres. 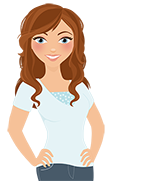 Store the bowls in a container in the fridge or in a very cool room until you are ready to use them. 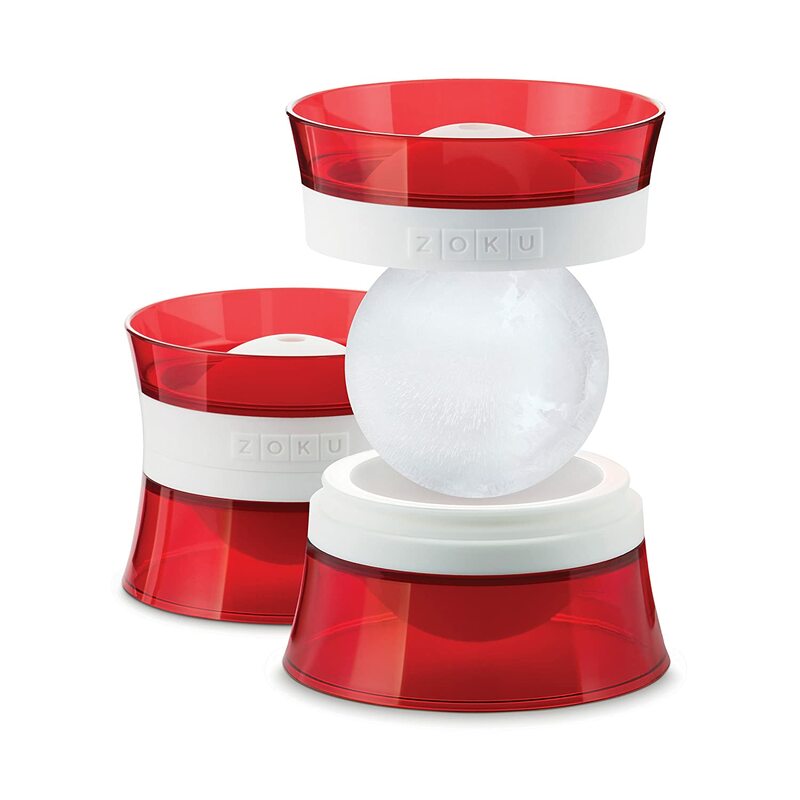 Here is the link for the Zoku Ice Ball Molds if you would like to pick up a set for yourself. The ice balls are perfect for keeping cocktails and beverages cold without diluting the flavor. The soft, silicone molds are BPA and phthalate free. The ice spheres are easy to remove. Simply pull the molds apart to release the frozen sphere – no need to run them under water. 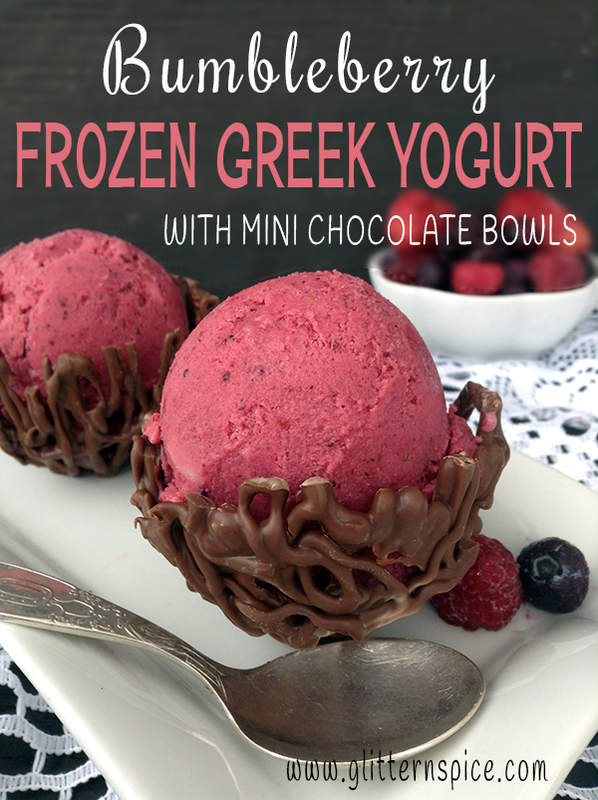 Thanks for visiting and I hope you enjoyed my recipe for bumbleberry frozen greek yogurt and mini chocolate bowls! I will have to make this. Looks so good. What a creative idea! I love the way you make the bowls – so clever! My girls would go crazy over this!